Jonathan Earl Franzen (born August 17, 1959) is an American novelist and essayist. His 2001 novel The Corrections, a sprawling, satirical family drama, drew widespread critical acclaim, earned Franzen a National Book Award, was a Pulitzer Prize for Fiction finalist, earned a James Tait Black Memorial Prize and was shortlisted for the International Dublin Literary Award. His novel Freedom (2010) garnered similar praise and led to an appearance on the cover of Time magazine alongside the headline "Great American Novelist". Franzen has contributed to The New Yorker magazine since 1994. His 1996 Harper's essay Perchance to Dream bemoaned the state of contemporary literature. Oprah Winfrey's book club selection in 2001 of The Corrections led to a much publicized feud with the talk show host. In recent years, Franzen has become recognized for his opinions on everything from social networking services such as Twitter ("What happens to the people who want to communicate in depth, individual to individual, in the quiet and permanence of the printed word? "; "the actual substance of our daily lives is total electronic distraction") to the impermanence of e-books ("All the real things, the authentic things, the honest things, are dying off.") and the self-destruction of America. Franzen was born in Western Springs, Illinois, the son of Irene (née Super) and Earl T. Franzen. His father, raised in Minnesota, was the son of an immigrant from Sweden; his mother's ancestry was Eastern European. Franzen grew up in Webster Groves, a suburb of St. Louis, Missouri, and graduated from Swarthmore College with a degree in German in 1981. As part of his undergraduate education, he studied abroad in Germany during the 1979-80 academic year with Wayne State University's Junior Year in Munich program. Here he met Michael A. Martone, on whom he would later base the character Walter Berglund in Freedom. He also studied on a Fulbright Scholarship at Freie Universität Berlin in Berlin in 1981-82; he speaks fluent German. Franzen was married in 1982 and moved with his wife to Somerville, Massachusetts to pursue a career as a novelist. While writing his first novel, The Twenty-Seventh City, he worked as a research assistant at Harvard University's Department of Earth and Planetary Sciences, coauthoring several dozen papers. In September 1987, a month after he and his wife moved to New York City, Franzen sold The Twenty-Seventh City to Farrar Straus & Giroux. The Twenty-Seventh City, published in 1988, is set in Franzen's hometown, St. Louis, and deals with the city's fall from grace, St. Louis having been the "fourth city" in the 1870s. This sprawling novel was warmly received and established Franzen as an author to watch. In a conversation with novelist Donald Antrim for Bomb Magazine, Franzen described The Twenty-Seventh City as "a conversation with the literary figures of my parents' generation[,] the great sixties and seventies Postmoderns. ", adding in a later interview "I was a skinny, scared kid trying to write a big novel. The mask I donned was that of a rhetorically airtight, extremely smart, extremely knowledgeable middle-aged writer." Strong Motion (1992) focuses mainly on a dysfunctional family, the Hollands, and uses seismic events on the American East Coast as a metaphor for the quakes that occur in family life (as Franzen put it, "I imagined static lives being disrupted from without—literally shaken. I imagined violent scenes that would strip away the veneer and get people shouting angry moral truths at each other."). A 'systems novel', the key 'systems' of Strong Motion according to Franzen are "... the systems of science and religion—two violently opposing systems of making sense in the world." The novel was not a financial success at the time of its publication. Franzen subsequently defended the novel in his 2010 Paris Review interview, remarking "I think they [critics and readers] may be overlooking Strong Motion a little bit." Franzen's The Corrections, a novel of social criticism, garnered considerable critical acclaim in the United States, winning both the 2001 National Book Award for Fiction and the 2002 James Tait Black Memorial Prize for fiction. The novel was also a finalist for the 2001 National Book Critics Circle Award for Fiction, the 2002 PEN/Faulkner Award, and the 2002 Pulitzer Prize for Fiction (won by Richard Russo for Empire Falls). I had some hope of actually reaching a male audience and I've heard more than one reader in signing lines now at bookstores say "If I hadn't heard you, I would have been put off by the fact that it is an Oprah pick. I figure those books are for women. I would never touch it." Those are male readers speaking. I see this as my book, my creation. Soon afterward, Franzen's invitation to appear on Oprah's show was rescinded. Winfrey announced, "Jonathan Franzen will not be on the Oprah Winfrey show because he is seemingly uncomfortable and conflicted about being chosen as a book club selection. It is never my intention to make anyone uncomfortable or cause anyone conflict. We have decided to skip the dinner and we're moving on to the next book." These events gained Franzen and his novel widespread media attention. The Corrections soon became one of the decade's best-selling works of literary fiction. At the National Book Award ceremony, Franzen said "I'd also like to thank Oprah Winfrey for her enthusiasm and advocacy on behalf of The Corrections." Following the success of The Corrections and the publication of The Discomfort Zone and How to Be Alone, Franzen began work on his next novel. In the interim, he published two short stories in The New Yorker: "Breakup Stories", published November 8, 2004, concerned the disintegration of four relationships; and "Two's Company", published May 23, 2005, concerned a couple who write for TV, then split up. In 2011, it was announced that Franzen would write a multi-part television adaptation of The Corrections in collaboration with The Squid and the Whale director Noah Baumbach for HBO. HBO has since passed on Corrections, citing "difficulty" in "adapting the book's challenging narrative, which moves through time and cuts forwards and back": that would be "difficult to sustain in a series and challenging for viewers to follow, hampering the potential show's accessibility." On June 8, 2009, Franzen published an excerpt from Freedom, his novel in progress, in The New Yorker. The excerpt, titled "Good Neighbors", concerned the trials and tribulations of a couple in St. Paul, Minnesota. On May 31, 2010, a second excerpt — titled "Agreeable" — was published, also in The New Yorker. On October 16, 2009, Franzen made an appearance alongside David Bezmozgis at the New Yorker Festival at the Cedar Lake Theatre, reading a portion of his forthcoming novel. Sam Allard, writing for North By Northwestern about the event, said that the "...material from his new (reportedly massive) novel" was "as buoyant and compelling as ever" and "marked by his familiar undercurrent of tragedy". Franzen read "an extended clip from the second chapter." On September 9, 2010, Franzen appeared on Fresh Air to discuss Freedom in the wake of its release. Franzen has drawn what he describes as a "feminist critique" for the attention that male authors receive over female authors—a critique he supports. Franzen also discussed his friendship with David Foster Wallace and the impact of Wallace's suicide on his writing process. Freedom was the subject of a highly unusual "recall" in the United Kingdom starting in early October 2010. An earlier draft of the manuscript, to which Franzen had made over 200 changes, had been published by mistake. The publisher, HarperCollins, initiated an exchange program, but thousands of books had been distributed by that time. 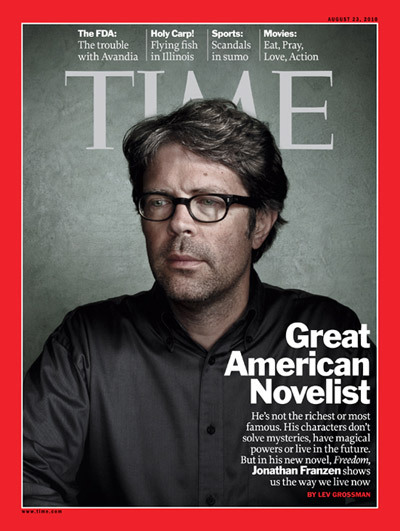 While promoting the book, Franzen became the first American author to appear on the cover of Time magazine since Stephen King in 2000. Franzen appeared alongside the headline "Great American Novelist". He discussed the implications of the Time coverage, and the reasoning behind the title of Freedom in an interview in Manchester, England, in October 2010. Franzen has stated the writing of Freedom was deeply impacted by the death of his close friend and fellow novelist David Foster Wallace. In an interview with Portland Monthly on December 18, 2012, Franzen revealed that he currently had "a four-page, single-spaced proposal" for a fifth novel he was currently working on, although he went on to suggest that while he had a proposal there was no guarantee that what was proposed would make the final cut, saying of similar proposals for previous novels, "I look at the old proposals now, and I see the one part of them that actually got made into a book, and I think, 'How come I couldn't see that? What is all this other stuff?'". Franzen also hinted that the new novel would probably also be long, adding "I've let go of any illusion that I'm a writer of 150-page novels. I need room to let things turn around over time and see them from the whole lives of other characters, not just the single character. For better or worse, one point of view never seems to do it for me." In October 2014, during a discussion at Colgate University, Franzen read a "self-contained first-person narrative" that is part of a novel that he hopes will be out in the summer of 2015. On November 17, 2014, The New York Times Artsbeat Blog reported that the novel, titled Purity, would be out in September. Jonathan Galassi, president and publisher of Farrar, Straus & Giroux, described Purity as a multigenerational American epic that spans decades and continents. The story centers on a young woman named Purity Tyler, or Pip, who doesn't know who her father is and sets out to uncover his identity. The narrative stretches from contemporary America to South America to East Germany before the collapse of the Berlin Wall, and hinges on the mystery of Pip's family history and her relationship with a charismatic hacker and whistleblower. In 2016, Daily Variety reported that the novel was in the process of being adapted into a 20-hour limited series for Showtime by Todd Field who would share writing duties with Franzen and the playwright Sir David Hare. It would star Daniel Craig as Andreas Wolf and be Executive Produced by Field, Franzen, Craig, Hare & Scott Rudin. However, in a February 2018 interview with The Times London, Hare said that, given the budget for Field's adaptation (170 million), he doubted it would ever be made, but added "It was one of the richest and most interesting six weeks of my life, sitting in a room with Todd Field, Jonathan Franzen and Daniel Craig bashing out the story. They're extremely interesting people." Purity was a relative commercial disappointment compared to Franzen's two previous novels, selling only 255,476 copies, compared to 1.15 million copies of Freedom and 1.6 million copies of The Corrections. In 1996, while still working on The Corrections, Franzen published a literary manifesto in Harper's Magazine entitled Perchance to Dream. Referencing manifestos written by Philip Roth and Tom Wolfe, among others, Franzen grappled with the novelist's role in an advanced media culture which seemed to no longer need the novel. In the end, Franzen rejects the goal of writing a great social novel about issues and ideas, in favor of focusing on the internal lives of characters and their emotions. Given the huge success of The Corrections, this essay offers a prescient look into Franzen's goals as both a literary and commercially minded author. In 2002, Franzen published a critique of the novels of William Gaddis, entitled "Mr. Difficult", in The New Yorker. He begins by recounting how some readers felt The Corrections was spoiled by being too high-brow in parts, and summarizes his own views of reading difficult fiction. He proposes a "Status model", whereby the point of fiction is to be Art, and also a "Contract model", whereby the point of fiction is to be Entertainment, and finds that he subscribes to both models. He praises The Recognitions, admits that he only got halfway through J R, and explains why he does not like the rest of Gaddis's novels. In 2004 Franzen published "The Discomfort Zone", a personal essay about his childhood and family life in Missouri and his love of Charles M. Schulz's Peanuts, in The New Yorker. Susan Orlean selected it for the subsequent volume of The Best American Essays. Since The Corrections Franzen has published How to Be Alone (2002), a collection of essays including "Perchance To Dream", and The Discomfort Zone (2006), a memoir. How To Be Alone is essentially an apologia for reading, articulating Franzen's uncomfortable relationship with the place of fiction in contemporary society. It also probes the influence of his childhood and adolescence on his creative life, which is then further explored in The Discomfort Zone. In September 2007, Franzen's translation of Frank Wedekind's play Spring Awakening (German: Frühlings Erwachen) was published. In his introduction, Franzen describes the Broadway musical version as "insipid" and "overpraised." In an interview with New York magazine, Franzen stated that he had in fact made the translation for Swarthmore College's theater department for $50 in 1986 and that it had sat in a drawer for 20 years since. After the Broadway show stirred up so much interest, Franzen said he was inspired to publish it because "I knew it was a good translation, better than anything else out there." Franzen published a social commentary on cell phones, sentimentality, and the decline of public space, "I Just Called To Say I Love You" (2008), in the September/October 2008 issue of MIT Technology Review. In 2012 he published Farther Away, a collection of essays dealing with such topics as his love of birds, his friendship with David Foster Wallace, and his thoughts on technology. In 2013, Franzen published The Kraus Project. It consists of three major essays by the "Perennially ... impossible to translate" Austrian "playwright, poet, social commentator and satirical genius" Karl Kraus – ""Heine and the Consequences" a takedown of the beloved German poet, "Nestroy and Posterity" which established that playwright's reputation in Austria to this day, and "Afterword to Heine and the Consequences"". The essays are accompanied by "Franzen's [own] plentiful, trenchant yet off-beat annotations" taking on "... Kraus' mantle-commenting on what Kraus would say (and what Franzen's opinion is) about Macs and PCs; decrying Twitter's claim of credit for the Arab Spring; and unfurling how media conglomerates influence politics in their quest for profits." Franzen is set to publish his third essay collection, The End of the End of the Earth: Essays, in November 2018  According to advance press for the book, the collection "gathers essays and speeches written mostly in the past five years, [and] Jonathan Franzen returns with renewed vigor to the themes—both human and literary—that have long preoccupied him. Whether exploring his complex relationship with his uncle, recounting his young adulthood in New York, or offering an illuminating look at the global seabird crisis, these pieces contain all the wit and disabused realism that we've come to expect from Franzen. Taken together, these essays trace the progress of a unique and mature mind wrestling with itself, with literature, and with some of the most important issues of our day, made more pressing by the current political milieu. The End of the End of the Earth is remarkable, provocative, and necessary." In a profile piece for The New York Times Magazine in June 2018, Franzen revealed that he is currently at work on the early stages of his sixth novel, which he speculates could be his last. "So, I may be wrong ... But somehow this new one really does feel like my last." What time of day do you work, and what do you write on? I read an interview with an author who says that, at a certain point in writing a novel, the characters "take over" and tell him what to do. Does this happen to you, too? In the lecture he said of the third question in particular "This one always raises my blood pressure" and quoted Nabokov in response. In February 2010, Franzen (along with writers such as Richard Ford, Margaret Atwood, and Anne Enright) was asked by The Guardian to contribute what he believed were ten serious rules to abide by for aspiring writers. Franzen lives in Santa Cruz, California with his "spouse-equivalent", writer Kathy Chetkovich. As first reported in his essay "My Bird Problem," Franzen is well known as a serious birdwatcher. He appeared on CBS Sunday Morning in March 2018 to discuss his love of birds and birdwatching. Franzen served for nine years on the board of the American Bird Conservancy. A feature-length documentary based on Franzen's reported essay "Emptying the Skies" was released in 2013. Franzen is a longtime fan of the punk-rock collective The Mekons; he appeared in the 2014 documentary Revenge of the Mekons to discuss the group's importance to him. In 2010, at an event at the Serpentine Pavilion in London celebrating the launch of Freedom, Franzen's glasses were stolen from his face by a gate-crasher, who jokingly attempted to ransom them for $100,000 before being apprehended by police elsewhere in Hyde Park. In January 2011, The Observer named him as one of "20 activists, filmmakers, writers, politicians and celebrities who will be setting the global environmental agenda in the coming year". On May 21, 2011, Franzen delivered the commencement address at Kenyon College to the class of 2011. The first international academic symposium solely dedicated to Franzen's work took place at Glasgow University, UK, 22 March 2013. Another one, "Jonathan Franzen: Identity and Crisis of the American Novel", was scheduled to take place at the University of Córdoba, Spain, 18–19 April 2013. "Somewhere North of Wilmington". Blind Spot 8. (1996):116. "The Failure," The New Yorker, 5 July 1999. "At the Party for the Artists with No Last Name." Blind Spot 14 (1999): n.pag. "When the new wing broke away from the old mansion." The Guardian. 25 March 2003: n.pag. "Good Neighbors." The New Yorker. 8 June 2009.: n.pag. "Agreeable." The New Yorker. 31 May 2010: n. pag. "The Republic of Bad Taste." The New Yorker. 8 June 2015: n.pag. In 1996, Franzen appeared on Charlie Rose with friend and fellow author David Foster Wallace and author Mark Leyner to debate "The Future of American Fiction." 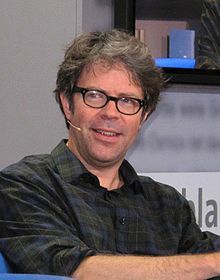 In 2001, Franzen appeared on Charlie Rose, on 21 November 2001 to discuss The Corrections; and again on 27 December after winning the National Book Award for The Corrections. In 2002, Franzen appeared on Charlie Rose (30 October 2002) to discuss his essay collection How to Be Alone. In 2006, Franzen guest starred alongside Michael Chabon, Tom Wolfe, and Gore Vidal in The Simpsons episode "Moe'N'a Lisa", which first aired 19 November 2006. In the episode, he is depicted fighting over literary influences with Chabon. In 2010, Franzen appeared on The Oprah Winfrey Show in support of her selection of Freedom for Oprah's Book Club. 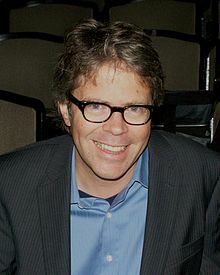 Several viewers noted the brevity of Franzen's appearance on the show, although a thirty-minute "After the Show" Q&A was later made available online. In 2015, Franzen appeared on The Late Show with Stephen Colbert and CBS This Morning to promote the release of Purity. In 2016, Franzen appeared on Jeopardy! as part of the show's Power Players Week, where journalists and intellectuals compete on the show with winnings donated to the player's charity of choice—Franzen played for the American Bird Conservancy. Franzen also appeared on Late Night with Seth Meyers. In 2018, Franzen appeared on CBS This Morning - Saturday to discuss his love of birds and birdwatching. ^ "Time 100 Candidates: Jonathan Franzen". Time Magazine. April 4, 2011. Retrieved 2014-11-19. ^ Hayden East (November 18, 2014). "New Jonathan Franzen novel Purity features Snowden-like hacker". The Telegraph. Retrieved 2014-11-19. ^ "Freedom: A Novel". Macmillan. Retrieved 2010-09-10. ^ a b Fehrman, Craig (August 16, 2010). "The Franzen Cover and a Brief History of Time". The Millions. ^ "Jonathan Franzen Is Fine With All of It". Retrieved 2018-06-26. ^ Flood, Alison (2012-03-07). "Jonathan Franzen: 'Twitter is the ultimate irresponsible medium'". The Guardian. London. ^ "Our Distraction: Franzen's Kraus Project - Los Angeles Review of Books". Los Angeles Review of Books. Retrieved 2018-08-17. ^ Franzen, Jonathan (2010). Freedom. Farrar Straus & Giroux. p. 218. ISBN 978-0-374-15846-0. ^ Flood, Alison (2012-01-30). "Jonathan Franzen warns ebooks are corroding values". The Guardian. London. ^ Manzoor, Sarfraz; Healey, Alex; Tait, Michael (2010-10-25). "Jonathan Franzen: 'America is almost a rogue state'". The Guardian. London. ^ "Jonathan Franzen Biography – Bio of Jonathan Franzen". Contemporary Literature. ^ Matassa Flores, Michele (September 15, 2010). "A sweaty-palmed night with Jonathan Franzen". Crosscut.com. Archived from the original on July 21, 2011. Retrieved 2011-08-20. ^ "Jonathan Franzen's struggle for 'Freedom'". Star Tribune. ^ "Jonathan Franzen '81 First Living American Novelist on Time Cover in Decade". Swarthmore. Archived from the original on 2012-08-05. Retrieved 2010-10-02. ^ Ferguson, Mark. "75 Years of the Junior Year in Munich." Die Unterrichtspraxis/Teaching of German 40.2 (Fall 2007): 124-132; p.132. ^ "Jonathan Franzen". PEN American Center. Archived from the original on 2012-10-04. ^ Burn, Interviewed by Stephen J. (2010). "Jonathan Franzen, The Art of Fiction No. 207". The Paris Review. Winter 2010 (195). ISSN 0031-2037. Retrieved 2018-06-20. ^ Willdorf, Nina. "An author's story: How literary It Boy Jonathan Franzen spun himself into a tornado of controversy". The Phoenix. Archived from the original on 2011-11-10. ^ Antrim, Donald. "Jonathan Franzen". Bomb Magazine. Fall 2001. Retrieved 2011-07-27. ^ a b c d Stephen J. Burn (Winter 2010). "Jonathan Franzen, The Art of Fiction No. 207". The Paris Review. ^ a b "Book Prize Information – The Corrections". Bookprizeinfo.com. Archived from the original on 2010-11-29. Retrieved 2010-03-15. ^ "PEN / Faulkner Foundation Award For Fiction Previous". Penfaulkner.org. Archived from the original on 2010-03-02. Retrieved 2010-03-15. ^ a b "Fiction". Past winners & finalists by category. The Pulitzer Prizes. Retrieved 2012-03-27. ^ Gross, Terry (October 15, 2001). "Novelist Jonathan Franzen". Fresh Air. NPR. ^ "You go, girl... and she went". The Age. 2006-01-21. Retrieved 2007-04-04. ^ Kachka, Boris (2013-08-05). "Corrections". Slate. ISSN 1091-2339. Retrieved 2018-08-17. ^ "National Book Awards Acceptance Speeches: Jonathan Franzen". National Book Foundation. 2001. Retrieved 2007-04-04. ^ "jonathan franzen: Contributors". The New Yorker. Archived from the original on 2011-06-07. Retrieved 2010-03-15. ^ O'Neal, Sean (September 6, 2011). "Noah Baumbach developing Jonathan Franzen's The Corrections as HBO series". A. V. Club. ^ Rose, Lacey (2011-09-02). "Noah Baumbach to Take on Jonathan Franzen's 'The Corrections' for HBO". The Hollywood Reporter. ^ Andreeva, Nellie (May 1, 2012). "HBO Drama Pilot 'The Corrections' Not Going Forward". Deadline. ^ "Festival". The New Yorker. 2009-01-07. Retrieved 2010-03-15. ^ a b "The Franzen Interface". North by Northwestern. Retrieved 2010-03-15. ^ "Franzen On The Book, The Backlash, His Background". Fresh Air. NPR. 2010-09-09. Retrieved 2010-09-10. ^ Flood, Alison; Davis, Rowenna (2010-10-01). "Jonathan Franzen's book Freedom suffers UK recall". The Guardian. London. ^ Haslam, Dave (October 3, 2010). "Onstage interview with celebrated American novelist Jonathan Franzen". Dave Haslam, Author and DJ – Official Site. Archived from the original on June 30, 2013. ^ Kellogg, Carolyn (September 18, 2010). "Oprah's book club christens Franzen's 'Freedom'". Los Angeles Times. ^ "Author Jonathan Franzen Appears on 'Oprah' Show". ABC News. ^ Jonathan Franzen, Jonathan Franzen: 'Modern life has become extremely distracting', The Guardian, 2 October 2015. ^ a b c "Q&A: Jonathan Franzen". portlandmonthlymag.com. Retrieved 3 June 2015. ^ Rice, Jessica. "Author Jonathan Franzen visits Colgate as part of Living Writers course". Colgate University. Retrieved 3 November 2014. ^ a b Alter, Alexandra. "New Jonathan Franzen Novel, 'Purity,' Coming in September". Colgate The New York Times Blog. Retrieved 17 November 2014. ^ Wagmeister, Elizabeth (2016). "Showtime Lands Daniel Craig, Scott Rudin Limited Series 'Purity'". Daily Variety. ^ Maxwell, Dominic (2018). "David Hare: 'I am sick to death of hearing about the need for strong women as protagonists'". The Times. ^ Franzen, Jonathan (1996). "Perchance to dream: In the age of images, a reason to write novels". Harper's. ^ Franzen, Jonathan (2002). "Mr. Difficult". The New Yorker. ^ Cohen, Lisa. "Resources for Graphic Novels". AP Central. Archived from the original on 2016-03-04. Retrieved 2015-10-04. ^ "Q&A With 'Spring Awakening: A Play' Translator Jonathan Franzen". 2007-09-10. Retrieved 2009-01-21. ^ "I Just Called to Say I Love You". Technology Review. September 2008. Retrieved 2010-12-01. ^ Lopate, Phillip (May 18, 2012). "Manageable Discontents". New York Times. Retrieved 18 July 2012. ^ a b c d e "Michael Meller Literary Agency". melleragency.com. Archived from the original on 4 November 2014. Retrieved 3 June 2015. ^ Dyer, Geoff; Hare, David (2010-02-20). "Ten rules for writing fiction". The Guardian. London. Archived from the original on October 1, 2013. Retrieved 2010-03-15. ^ "Acclaimed author Jonathan Franzen embraces television". The Mercury News. 2016-04-20. Retrieved 2018-07-10. ^ "A conversation with novelist Jonathan Franzen". Telegraph.co.uk. 1 October 2010. Retrieved 3 June 2015. ^ "My Bird Problem". The New Yorker. Retrieved 2018-07-10. ^ "Why Novelist Jonathan Franzen Loves Birds". 2013-06-17. Retrieved 2018-07-10. ^ "How Jonathan Franzen fell in love with birds". Retrieved 2018-07-10. ^ Dana, Rebecca (2012-07-13). "'The Central Park Effect' Explores the Magical Power of Birding". The Daily Beast. Retrieved 2018-07-10. ^ "Farewell to ABC's George and Rita Fenwick | American Bird Conservancy". American Bird Conservancy. 2017-05-30. Retrieved 2018-07-10. ^ "Emptying the Skies". The New Yorker. Retrieved 2018-07-10. ^ "Emptying the Skies | Music Box Films". ^ "Far-Flung, Long-Lasting and Still Punk at the Core". Retrieved 2018-07-10. ^ "Franzen's glasses stolen at launch". The Bookseller. Archived from the original on 2010-10-10. ^ Armitstead, Claire (2010-10-05). "Who stole Jonathan Franzen's glasses?". The Guardian. London. ^ "Why I stole Franzen's glasses". GQ. 2010-10-06. ^ "Jonathan Franzen – Fulbright Student to Germany, 1981". state.gov. Retrieved 3 June 2015. ^ "International Author of the Year". National Book Awards 2014. Retrieved 3 June 2015. ^ "2011 Chicago Tribune Heartland Prize Winners | Jonathan Franzen | Isabel Wilkerson | Chicago Humanities Festival". chicagohumanities.org. Retrieved 2018-07-12. ^ "John Gardner Fiction Book Award Past Winners - English, General Literature and Rhetoric | Binghamton University". English, General Literature and Rhetoric - Binghamton University. Retrieved 2018-07-12. ^ Alejandro Alvarado (25 November 2012). "Dan medalla Carlos Fuentes a Franzen" [Carlos Fuentes medal given to Franzen]. Reforma.com (in Spanish). Grupo Reforma. Retrieved 2012-11-25. ^ Richard Kämmerlings (October 4, 2013). "Jonathan Franzen erhält den "Welt"-Literaturpreis". Die Welt. Retrieved 2013-10-06. ^ "22nd International Book Festival Budapest". konyvfesztival.com. Retrieved 3 June 2015. ^ "Euronatur Award". euronatur.org. 27 December 2017. ^ Sedlmaier, Tobias (2017-05-10). "Jonathan Franzen ausgezeichnet | NZZ". Neue Zürcher Zeitung (in German). ISSN 0376-6829. Retrieved 2018-06-23. ^ "The 10 Best Books of 2010". Retrieved 2018-06-23. ^ "Franzen" (in German). Retrieved 2018-06-23. ^ Lewis, Michael (2011-04-21). "The 2011 TIME 100 - TIME". Time. ISSN 0040-781X. Retrieved 2018-06-23. ^ Schuessler, Jennifer (March 9, 2012). "Franzen, Chabon and Lahiri Named to the American Academy of Arts and Letters". The New York Times. ^ Siegle, Lucy (2011-01-16). "Green giants: the eco power list". The Observer. London. ^ "Oh the Places You'll Go: Jonathan Franzen at Kenyon". The New Yorker. 10 June 2011. Retrieved 3 June 2015. ^ "Jonathan Franzen and Contemporary Realisms Friday 22nd March – cfp.english.upenn.edu". upenn.edu. Retrieved 3 June 2015. ^ "Jonathan Franzen. International Symposium. Córdoba, Spain, April 2013 – cfp.english.upenn.edu". upenn.edu. Retrieved 3 June 2015. ^ Franzen, Jonathan (1988). The Twenty-Seventh City. New York: Farrar, Straus and Giroux. ^ Alter, Alexandra (2014-11-17). "New Jonathan Franzen Novel, 'Purity,' Coming in September". New York Times. Retrieved 2014-11-17. ^ Burn, Stephen (2008). Jonathan Franzen at the End of Postmodernism. Continuum Books. pp. 144–145. ISBN 978-1-8470-6248-2. ^ "Issue 17.1 - Fiction International". fictioninternational.sdsu.edu. Retrieved 2018-07-14. ^ Barrie-Anthony, Steven (2005-11-30). "The call of 'D'oh!'". Los Angeles Times. Retrieved 2010-09-10. The script calls for Chabon and Franzen to brawl during a dispute about their literary influences, and standing next to each other in the recording room, the friends ready themselves for a fight. Franzen complains loudly that he has fewer lines than Chabon – "Only 38 words!" – to which Chabon responds, "I see there's a little counting going on in the Franzenian corner." ^ "Franzen Meets Oprah". The New Yorker. Retrieved 2018-07-14. ^ Julian, Kate (2010-12-07). "The Franzen and Oprah Show". Slate. ISSN 1091-2339. Retrieved 2018-07-14. ^ "After the Show with Jonathan Franzen and Freedom". Oprah.com. Retrieved 2018-07-14. ^ Kellogg, Carolyn. "Jonathan Franzen tells Stephen Colbert a bedtime story". latimes.com. Retrieved 2018-07-12. ^ "Jonathan Franzen's Appearance on Jeopardy! Was Perfect TV". Time. Retrieved 2018-07-12. ^ "How Jonathan Franzen fell in love with birds". Retrieved 2018-07-12. Burn, Stephen J. Jonathan Franzen at the End of Postmodernism. London/New York 2011. Freitag, Sibylle. The Return of the Real in the Works of Jonathan Franzen. Essen (Germany) 2009. Weinstein, Philip. Jonathan Franzen: The Comedy of Rage. Bloomsbury, 2015. Wikimedia Commons has media related to Jonathan Franzen.